Love the beauty of the Bible? 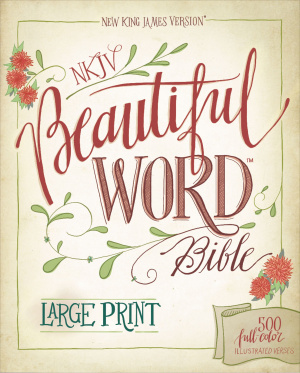 NKJV, Beautiful Word Bible, Large Print, Hardcover, Red Letter Edition by Zondervan was published by Zondervan in February 2017 and is our 2876th best seller. The ISBN for NKJV, Beautiful Word Bible, Large Print, Hardcover, Red Letter Edition is 9780310446088. Got a question? No problem! Just click here to ask us about NKJV, Beautiful Word Bible, Large Print, Hardcover, Red Letter Edition. What font does large print word bible have (not too large I hope)! A:The Large Print edition is in a size 10 font. Thank you for using the Q&A Forum.